Description: UP 4355 sits in the CSX intermodal yard in downtown Atlanta, lashed with NS 2607. Description: One of three UP locomotives idling at the north end of UP/WPRR yard. Description: Crossing the bridge over Capoolong Creek at the junction to the dismantled ex-Lehigh Valley Kingtown Branch, 08:36 hours. Description: Train ARIESR 11 heads east over Missouri Route 25. Description: Eastbound through Poplar Bluff. Description: 4355 hustles a westbound through Rochelle, IL. Description: UP 4845 AND 4355 LEAVING LAGRANGE WITH CSX ON THE LEAD END. 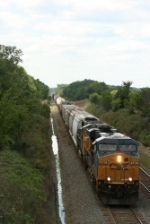 Title: UP 7367 Swings a EB stack Thur town. Description: EB stacks wake up the small town of Ethel Mo as this boy screams past.